BMAB UK reached the milestone of 20 tournaments this weekend. However, this achievement was tempered by the very sad news that founder and regular TD Rick Janowski would not be able to be with us. I announced at the December BMAB (UK) tournament that Rick has decided to step down from running BMAB (UK) and pass the baton on to Mark Adkins who I had the pleasure to wish well in his future role. Rick, to those who know him, is a force of nature; what he achieved in a matter of three months as the founder of BMAB International was incredible and many of us owe him a debt of gratitude. He ran BMAB (UK) with the same efficiency and was rewarded with successive awards as the UK tournament director of the year. He has decided wisely to step down from BMAB (UK) to concentrate on his health. BMAB international is in the safe hands of Dmitriy Obhukov and now BMAB (UK) has been handed over to Mark which I am sure will also be successful. We had an enthusiastic round of applause for Rick over the weekend and I am sure that is echoed by his UKBGF friends. I’d certainly like to echo Tim’s words; Rick was the driving force behind BMAB throughout its early days as it grew beyond the UK to become a worldwide institution and drive players to ever higher standards of play. I hope you’ll all join me in wishing him a speedy recovery and remembering the immense contribution he’s made – as well as our thanks to Mark for taking over the hot seat. Round one passed off with no big surprises, but round two brought together BMAB’s most consistent winner, Tim Cross, and its most consistent loser (me). Getting lots of league practice has certainly helped my game this year, but I was still very surprised to find myself steadily building up an 8-4 lead against one of my heroes, and then finishing it off with a 4-pointer… I certainly felt somewhat shell-shocked when I realised what I’d just done! Round three produced another very long match for me – usually I’d be tweeting a lot about the goings on in spare moments, but I was spending a lot of time at the board! Saturday night at BMAB tends to mean a chouette in the hotel lounge, and this time was no different. It seems to be a good chance for players who have spent hours playing as accurately as possible to indulge in a bit more adventurous play, as well as trying to wind up the box a bit! As Sunday got underway it appeared the tournament was going to form – I was brought back down to earth by Anna Price, who double-backgammoned me for a comprehensive 11-4 win, and then in round five I found myself 2-8 down against Jamie MacPherson and my dream was pretty much over. Meanwhile, Seb and Julian – both previous winners – were efficiently proceeding towards the title with five wins each. And here begins the lesson for all hopeful intermediates: never lose hope until the final roll is done… I gradually clawed my way back to a win against Jamie, so that with one round to go, we had the two grandmasters on five wins and myself and Mike Levi on four. Of course you can split money four ways but trophies and signed books are somewhat harder, so more games were required! By this time it was very late in the day and the two grandmasters generously passed on a playoff, leaving Mike and me to finish off a 1-point shootout. Clearly fatigue was setting in to both of us; we were both picking up the dice at the wrong moments, hitting a clock we weren’t even using and we were probably fortunate that the cameras were off at that point. But the dice had clearly decided that this would be my day… and both of us were over the moon at having taken on the best and come out on top this time! Many thanks are due to Mark Adkins for running a really smooth tournament and I’m very much looking forward to future ones! On that note, there will be some changes to the format for next year; there will be a larger December BMAB with a capacity of 32 players and run as a Swiss event rather than a partial round-robin, still with all games recorded and analysed. This one will then become a single event on the Tour instead of the cumulative event. December will therefore have two 32-player Tour events and give more scope for people to get those last-minute Tour points instead of having to attend multiple events; hopefully this will give the BMAB format wider appeal. You may well need to book early! 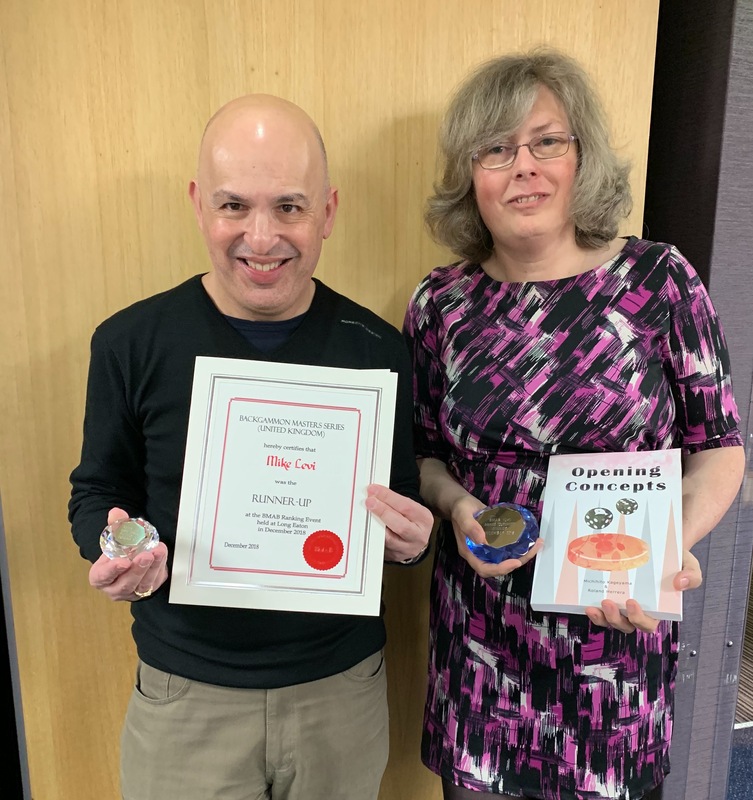 Congratulations Julia and Mike, great performances and another great advert for the Backgammon Workshop with the expected success of its two founders. I have to mention with a tinge of embarrassment my honour at being described as a backgammon hero, thankyou so much and I can honestly return a compliment to you Julia, you are truly lovely, well done on your joining the select list of winners at BMAB.